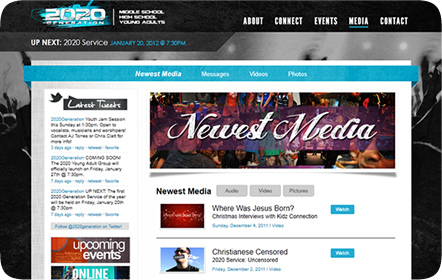 2020 Generation is the Youth and Young Adult ministry of Lord of the Harvest Church in San Antonio. Their vision is simple: change the world by spreading the word and the love of God, one person at a time. Led by Pastor Jonathan Clatt and his wife, Generation 2020 hosts events, services and retreats for anyone interested in becoming part of this community. Generation 2020 wants to connect with every young person and become what God has called them to be. 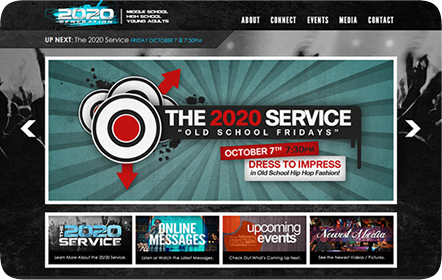 We worked with Clatt Creative to develop 2020 Generation’s website. Clatt Creative designed the site to be visually appealing for their younger audience with grungy style applications and treatments throughout. It was our job to take the design and make a functional website online. To connect and keep up with the younger audience that makes up the ministry, 2020 also asked us to set up their social media accounts. 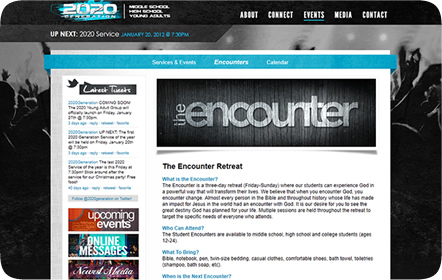 You can find 2020 on Facebook and Twitter, and their sermons can be found on Vimeo. 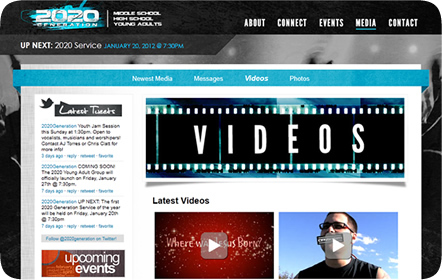 The social aspect of 2020 sets it apart from other youth ministries, making it be a part of this generation’s everyday life.